As we noted in our post of 30 November 2017 (“The Nile waters negotiations: Egypt declares failure”), Ethiopia’s Grand Ethiopian Renaissance Dam project (the GERD) will reduce Egypt’s supply of Nile water in the short and medium terms. Egypt has accepted that the dam will be built but wants Ethiopia to agree to extend the period over which the reservoir behind it will be filled, so as to spread the impact over as many years as possible. Ethiopia has envisaged a five or six-year period; Egypt is looking for more . In November last year, Muhammad Abd al-Ati (Mohamed Abdel Atti), the Egyptian Minister of Irrigation and Water Resources, announced that Egypt, Ethiopia and Sudan had failed to reach consensus on the way forward. There have been several significant developments since then. In May this year, a nine-member committee from Egypt, Ethiopia and Sudan approved, in principle, a preliminary report on the technical effects of the GERD on Egypt and Sudan. 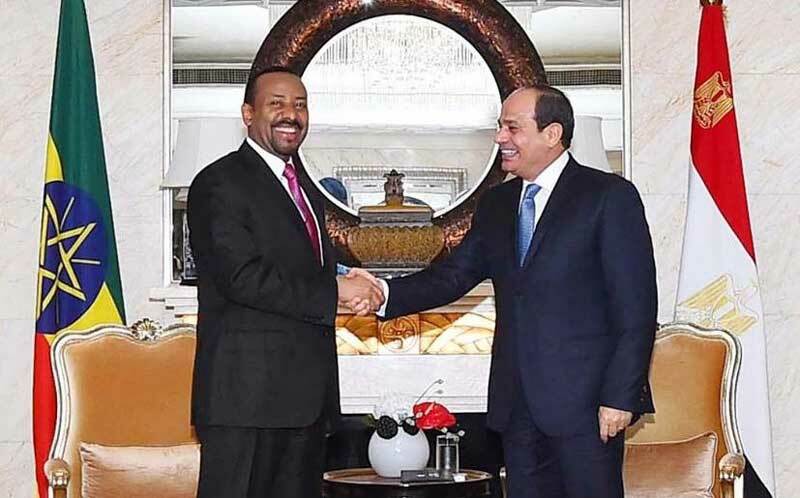 The following month, President Sisi of Egypt and Ethiopia’s Abiy Ahmed (who became Prime Minister in April this year) met in Cairo to discuss the project. Sisi was unable to secure any kind of written agreement from his interlocutor. Instead, at a press conference following their meeting, he called on Abiy Ahmed to swear “by Allah” that Ethiopia would “not do anything that harms Egypt’s water share.” Abiy Ahmed did so, although, in international law, his pledge has none of the force of a written document. In late July, the project manager of the GERD, Simegnew Bekele, was shot dead in Addis Ababa. Given the scale of the project and its importance to the future of Ethiopia’s economy, Bekele was a high-profile figure in Ethiopia. So far, however, no one has been charged with his murder, which cannot (at least at this stage) be definitively linked to his work on the GERD. On 25 August, Abiy Ahmed announced that the project would not be completed on schedule. While the civil-engineering work, being carried out by Salini Impregilo, an Italian company, is on track, the electro-mechanical work is not. MeTEC, a subsidiary of Ethiopia’s Ministry of Defence, which had been entrusted with the electro-mechanical work, had failed to install the turbines in the dam on time. Giving MeTEC a major role in the project was one manifestation of the government’s desire to rely, as much as possible, on Ethiopia’s own resources. (Another manifestation of this desire was the funding of the project wholly from domestic sources.) However, the company had no previous experience of delivering a project on this scale and self-reliance, in this case, had obviously been taken too far. MeTEC is likely to lose its contract and be replaced by a more experienced and efficient company. Sisi and Abiy Ahmed, in Beijing for the FOCAC (Forum on China-Africa Cooperation), met on 2 September. They discussed the GERD but – judging by the absence of any joint statement – their talks did not make any real progress. Nevertheless, the GERD’s difficulties give Egypt a valuable breathing space. It could use its lucky break in several ways. The first is to redouble its efforts to increase the efficiency with which water is used. Since irrigation consumes 84% of Egypt’s water budget, agriculture is the sector which has most potential for savings. Some steps, such as government decisions as to how much acreage should be devoted to which crops, can have an effect within 12 months. However, some of these possible measures would require the expenditure of substantial sums on infrastructure, for example, the installation of more efficient systems for delivering water to the fields. Despite Egypt’s aspiration to become a natural gas exporter again by 2018 based on recent gas discoveries, the country’s economic situation would make it difficult to find the funds. Moreover, the results might not emerge for several years. The other way in which Egypt could usefully exploit the extra time it has been given would be to intensify the negotiations with Ethiopia. It could perhaps increase its offer of economic cooperation and development assistance, in the hope that this would tempt Ethiopia to extend the reservoir-filling period. It could also be beneficial to Egypt to seek external mediators, although it might be difficult to convince Abiy Ahmed to accept such a proposal. Ethiopia is the stronger party in these negotiations and so might not welcome the inclusion in them of a third party: it has already rejected an Egyptian suggestion that the World Bank should mediate. China might be well placed to offer its good offices, but it does not seem to have seized the opportunity to do so when Sisi and Abiy Ahmed met in Beijing. Another obvious contender is the US, although the Trump Administration (in spite of its high regard for Sisi) has apparently not shown any interest to date. Other countries with leverage with both Egypt and Ethiopia are Saudi Arabia and the UAE – and an article in Foreign Affairs (usually behind a pay wall) notes that the UAE’s mediation efforts contributed to the peace deal between Ethiopia and Eritrea in July this year. For the time being, however, such ideas are no more than speculation.